Fat (Wide) Shoelaces for Chucks, Group 1. These are Fat (Wide) shoelaces for high top chucks. The laces are 54 inches in length and are 9/16 inches wide. This group contains the most popular basic colors. Natural (Vanilla) fat laces match unbleached white high top chucks or chucks with off-white foxing.To view a photo gallery of how black, white, navy blue, natural, red, or royal blue shoelaces look on assorted pairs of chucks, click on the link: Wide Laces on Chucks Gallery 1. Fat (Wide) Shoelaces for Chucks, Group 2. These are Fat (Wide) shoelaces for high top chucks. The laces are 54 inches in length and are 9/16 or 5/8 inches wide. To see how charcoal grey, metal grey, gold, light gold, orange, yellow or burgundy fat shoelaces look on various pairs of chucks, click on the link: Wide Laces for Chucks Gallery 2. Fat (Wide) Shoelaces for Chucks, Group 3. These are Fat (Wide) shoelaces for high top chucks in hard to find colors. The laces are 54 inches in length and are 9/16 or 5/8 inches wide. 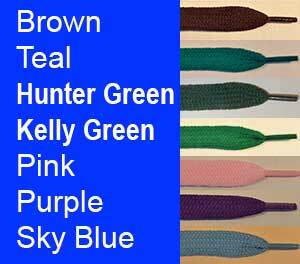 To see how brown, teal, hunter green, Kelly green, pink, purple, or sky blue fat shoelaces look on various pairs of chucks, click on the link: Wide Laces for Chucks Gallery 3. 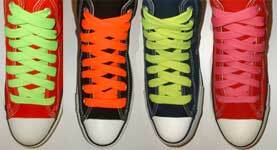 Neon Fat (Wide) Shoelaces for Chucks. These extra bright single color fat shoelaces come in four neon colors. 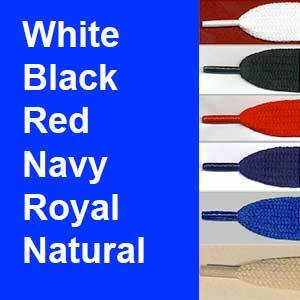 The laces are 54 inches in length and are 9/16 or 5/8 inches wide. To see a photo gallery of neon lime, neon orange, neon yellow or neon pink fat (wide) shoelaces on various pairs of chucks, click on this link: Wide Neon Laces Photo Gallery. Retro shoelaces give your chucks the look of the 1950s or 1960s again. Retro shoelaces are 1/2 inch wide and fit in between standard flat athletic laces and fat laces in width. These shoelaces are 45 inches in length and meant for low cut chucks or smaller size high tops with seven eyelet pairs. Now available in ten regular and neon colors. To see a photo gallery of how retro shoelaces look on various pairs of low cut or high top chucks, click on the appropriate gallery link: Photo Gallery of Retro Shoelaces on Low Cut Chucks. 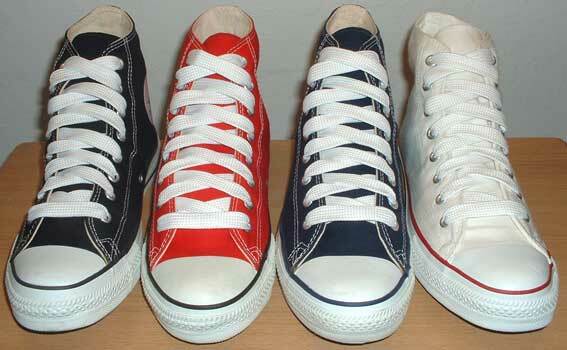 Photo Gallery of Retro Shoelaces on High Top Chucks. Left column colors: black, red, navy blue, royal blue, sky blue. 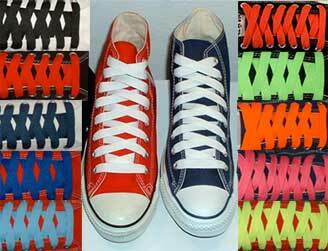 X-Fat (X-Wide) Shoelaces for Chucks. These are Extra Fat (Wide) shoelaces for high top chucks with eight eyelet pairs. 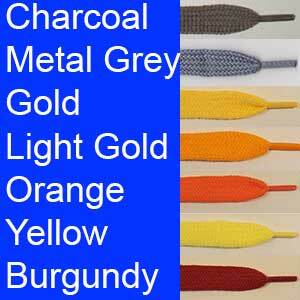 The laces are 54 inches in length and 3/4 inches wide and available in nine colors. To see a photo gallery of how extra fat (wide) shoelaces look on various pairs of low cut or high top chucks, click on the appropriate gallery link: Photo Gallery of Extra Fat (Wide) Shoelaces on Low Cut Chucks. 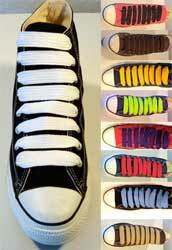 Photo Gallery of Extra Fat (Wide) Shoelaces on High Top Chucks.